Quick-Release Ball Lock Pins are also known as ball lock pins, ball pins, double ball detent pins, push button pins, Quick-Release pins, quick pins and hitch pins. 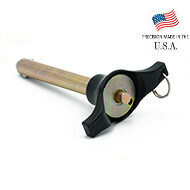 Quick-Release Ball Lock Pins have a push button that initiates ball action and retraction. 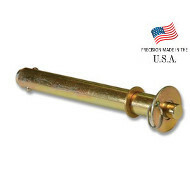 Quick-Release Ball Lock Pin design combines secure fastening with Quick-Release ease of removal. Double ball lock pin design increases retention capabilities. Steel Lanyards or Nylon Lanyards may be added as a low cost tether to prevent loss. Pivot Point’s Quick-Release Ball Lock Pin design features both a one-piece, cold formed body and spindle for increased durability. Now available with optional T-Handle! Positive Lock Pins are also known as ball lock pins, ball pins, double ball detent pins, push button pins, quick release pins, quick pins and hitch pins. Positive Lock Pins have a push button that initiates ball action and retraction. 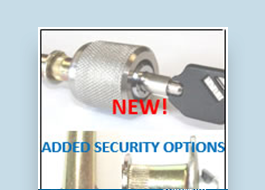 Positive lock pin design combines secure fastening with quick release ease of removal. 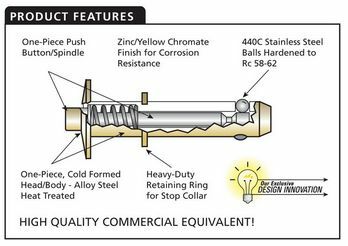 Double ball lock pin design increases retention capabilities. Steel Lanyards or Nylon Lanyards may be added as a low cost tether to prevent loss. 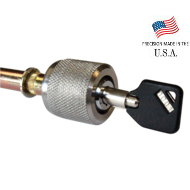 Security OptionsPivot Point’s Ball Lock Pin design features both a one-piece , cold formed body and spindle for increased durability.